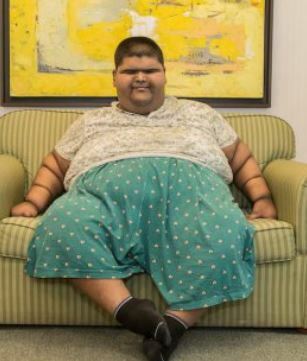 Metro.UK:- The ‘world’s heaviest teenager’ has managed to shed nearly a third of his body weight in just two months after having surgery in India. At just 14, Mihir Jain weighed a shocking 37 stone after surviving on a diet of fried food and fizzy drinks. He has already lost 10st since he had a gastric bypass in April. Mihir can now breathe properly for the first time and walk unaided. When he was born in November 2003, Mihir was 5lbs 5oz, considered a normal weight for a newborn. He started piling on weight in the following years and tipped the scale at 12st by the time he was five years old. At that time, Mihir’s parents were told by a doctor that he was obese and needed surgery, but he was too young for it, so he was given some medication instead. Even though his mother Puja Jain, 35, admits Mihir was always addicted to fried food, she believes the medicine made him bed-bound and he actually gained more weight. Ms Jain, said: ‘[The] side effects [of the medicine] meant he lost energy and he became weak on his legs. As the years passed he just used to sit in his bed all day, eating. So he just kept gaining and gaining more weight.’ His typical vegetarian, high-carbohydrate diet consisted of full-fat milk, fried potato and vegetable cutlets, vegetable curry and rice, and lots of ice cream, milky coffee and fizzy drinks. Eventually, in 2013, Mihir’s parents went to see Dr Pradeep Chowbey at Max Hospital, in Delhi, to discuss surgery – but Mihir was so big at this point that they couldn’t get him out of the house to bring him with them. It was five years before Mihir was able to make it to hospital, in December 2017, by which point he weighed over 37st. He was suffering with diabetes, breathing issues and high blood pressure, and, with a height of 5ft 2in, had a body mass index (BMI) of 100 – the highest for his age. Mihir needed to lose some weight before he could have the surgery, so he was put on a high protein diet. ‘I was determined to do what the doctor suggested,’ he said. ‘And when I lost weight on my own it gave me the determination to keep going. I wasn’t even scared about surgery, I just wanted to do what was needed to get better.’ After undergoing surgery on April 4, Mihir stayed in hospital for four days on a liquid diet before being discharged.